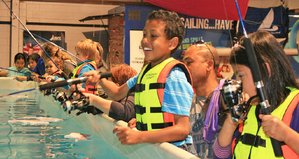 Although the Hutchwilco New Zealand Boat Show is packed full of the latest boats, engines, fishing gear and the like, there’s plenty to see and do for every member of the family and it is a truly great day out for the kids. The Youthtown Aqua Fun Zone is just what it sounds like: a fun area filled with “aqua” activities and run by the wonderful crew from Youthtown. There’s a heated pool and kids are encouraged to bring their togs and a towel and have a go at snorkelling or kayaking. There’s also a fun obstacle course, sailing and windsurfing simulators, underwater hockey and kayaking demos and the always-popular Kids’ Fishing Contest. Children of all ages can also have a go at building a craft masterpiece, learn knot skills and take the Aquafun Zone Quest. There’s a colouring contest for the very young and, most importantly, a Chill Zone so the adults can relax while the children enjoy all the fun activities. There’s plenty of prizes to be won, too, including a family trip on the Ted Ashby. Boat manufacturers, engine and electronics importers, all choose to release their latest products at the Hutchwilco New Zealand Boat Show. The Whitecloud 9m is a new long-range “trailer launch” that can be trailered, moored in a marina or stored in a hardstand. Although inboard-powered, there is no motor box, just a flat cockpit sole. There is accommodation for four and a full size head in the forward cabin. The boat comes complete with electronics, including radar and autopilot, a galley with cooker and a separate recessed barbecue. Auckland City Marine’s new aluminium Pinnacle 660 SD is designed by Scott Robson and powered by a compact Mercury Tier 3 170hp diesel inboard. Intended for economical long-range game fishing, it comes with trim tabs, MFD, a Tek deck and an extensive list of extras. of extensive testing on the original Explorer 616. Popular 616 features, such as the fine entry, hydrodynamic stability chines and the hull shape have been further refined to improve soft riding. There is a dual walk-through to the platform, an expansive cockpit with room for 6 to fish and a 1.9m double bunk for overnight trips. The new Sea Blade SB20 Prestige is the result of 10 years of development and over $US2 million of investment and boasts 40% less G-Force loading and just 10-15% drag efficiency. Other features include a “must see” hull shape, a large interior, a luxurious sun deck and a large cockpit and platform for fishing and other water activities. While everyone loves a brand new boat, sometimes a quality second hand one can be just as good. The Tradeaboat Second-hand Boat Fair is ideal for those looking to get into boating for the first time and those looking to trade up or down. Handily placed alongside the Radio Sport Fishing Hall, the Tradeaboat Second-hand Boat Fair features only top quality, second hand boats from show exhibitors and all are for sale at very competitive prices.